A 14% complete feed with roughage for feeding as the sole feed for growing lambs in confinement. Contains grain, roughage, protein, vitamins and mineral supplements. 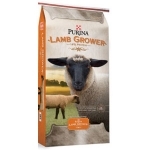 Provides all nutrients to help develop young, growing lambs. Click here for guaranteed analysis and more information. Honor® Show Chow® EXP 15 Pellet DX feed is designed to help promote early intakes and bloom in young lambs and kids. This feed is pelleted to reduce sorting and medicated with Deccox® to prevent coccidiosis. 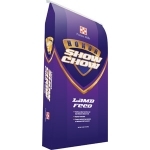 Honor® Show Chow® EXP 15 Pellet DX feed is supported by Purina. Get your best animals on Honor® Show Chow® EXP 15 Pellet DX feed today so they can reach their full potential. Click here for guaranteed analysis and more information.